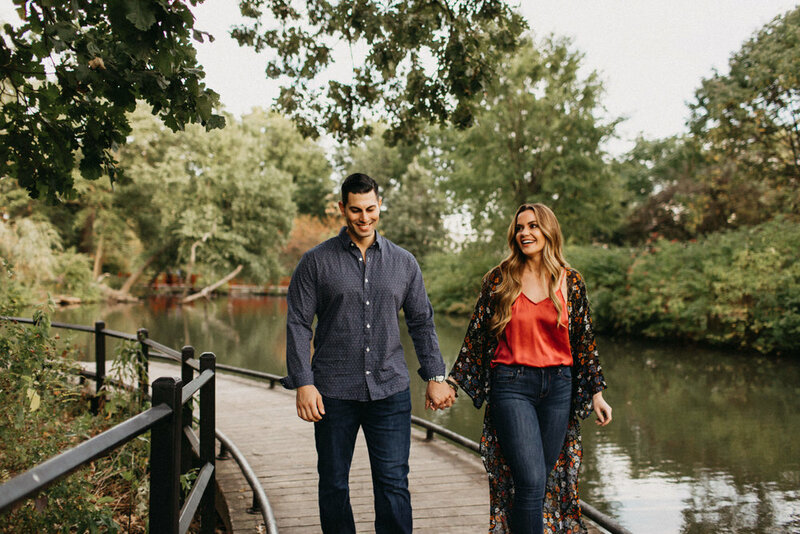 We met Beth and Christian at Gompers Park on the north side for their love sesh adventure. We had shot there a few years ago, and came specifically for the epic willow tree on the edge of the riverfront.... They started out cuddling in the midst of the long flowing branches, and then made their way up the hill where the leaves were the beautiful fall colors were in full display. The sun streamed through the golden leaves and with an oddly warm fall day at hand we made our way over to a stream and with zero hesitation these two jumped right in. The water was perfectly still and, looking close- it's almost hard to imagine that just a few hundred yards away, past the park and the trees, the busy city bustled on. These two were in their own little world as the last of the light danced over the water. These final serene moments were some of our favs, take a look below!